Petite Opera Productions: In Petite Opera's THE MIKADO, if you're caught flirting, it's off with your head! 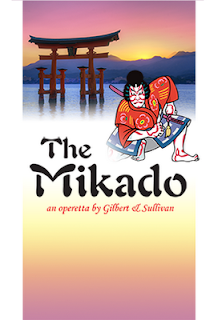 In Petite Opera's THE MIKADO, if you're caught flirting, it's off with your head! Limited run: April 20-May 5. Hold the Dates! You don't want to miss it! Legend has it that W.S. Gilbert attended the first Japanese Exhibition in England, purchased a samurai sword as a souvenir, and hung it over his doorway. Searching for the next suitable plot for a collaboration with Sir Arthur Sullivan, he was literally struck by an idea -- when the sword fell on him -- to set the next operetta in Japan... and The Mikado was born. The story is fun and twisted in typical Gilbert fashion. In the Japanese town of Titipu, Ko-Ko, a man condemned to death for flirting, is instead released and granted the title of Lord High Executioner. Unknowingly, he agrees to execute Nanki-Poo, the disguised son of the very eccentric and comic Mikado (the emperor), and all types of comic situations arise! The cast of characters is rounded out by a town nobleman (Pish-Tush) determined to have Ko-Ko execute himself, an arrogant, greedy nobleman (Pooh-Bah), three little maids (Yum-Yum, Pitti-Sing and Peep-Bo), one of whom (Yum-Yum) is to marry Ko-Ko but loves Nanki-Poo, an elderly woman (Katisha) pursuing Nanki-Poo, and an exquisite ensemble of maids and gentlemen of Japan. The marvelous score by Sir Arthur Sullivan is sprinkled with tunes you know and love, such as "Three Little Maids", "I've Got A Little List", and "Here's a How-De-Do". And for those who track popular culture, you're sure to love some of the modernized lyrics, courtesy of talented local writer H.R.T. Guillen (who contributed to Petite Opera's original productions Al Fresco - Life through Opera-Colored Glasses). Petite Opera is proud to bring Gilbert and Sullivan back to Park Ridge with this production by presenting one of the team's most popular collaborations. 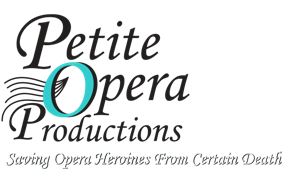 And Petite Opera's production has it all -- outrageously fun characters, wonderful singing, impeccable comic timing in true over-the-top British fashion, exquisite acting, marvelous sets, costumes and choreography all set to orchestra in an intimate space. This show is 100% family-friendly, and suitable for all ages. If you're a Gilbert and Sullivan fan, like musical comedy, if you loved Petite Opera's Al Fresco, or if you just want a fantastic evening out, you're sure to love this wonderful production. HOLD THE DATES or Reserve Your Tickets Now! To reserve in advance and pay via cash or check immediately before the performance, call 847.553.4442. Tickets may also be purchased up to 3 hours prior to the performance via credit card (convenience fees apply). Adults are $25, Seniors (age 62+) are $22, Students (K-College) are $15, and children age 5 and under are free!